Terry Berlier's solo show at Pro Arts gallery. Terry Berlier's "I Know Already." Terry Berlier has always kept her environmental artwork separate from her queerness. It's difficult to see how the two might overlap in a relevant way. 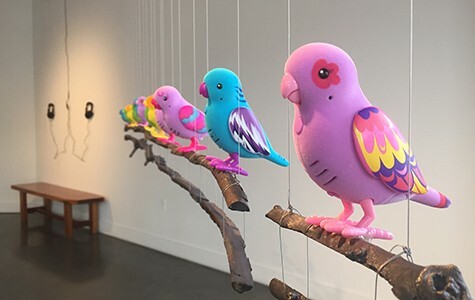 But in Giving up a fantasy is harder than giving up a reality, her new solo show at Pro Arts (150 Frank H. Ogawa Plaza, Oakland), she takes the first step into that intersection. Berlier's lengthy title is taken from a 2010 essay by Timothy Morton called "Queer Ecology." In the piece, Morton aligns the two titular theoretical frameworks, citing the ways in which both negotiate around constructed boundaries — those that create categories like sexuality, gender, species, and Nature. Morton uses a capital "N" because, to him, Nature is a fantasy, separated out merely by the conceptual lines we've drawn around it. And it is that idea of Nature, which we hold so dear, that is most difficult to give up when we try to face the truth of environmental degradation. Berlier's work makes fewer direct arguments than Morton's essay, but performs an aesthetic experiment that plucks points from the text and uses them to build an apparatus. Her sculptures waver between notions of Nature and Culture, with a playful tinge of toy design. 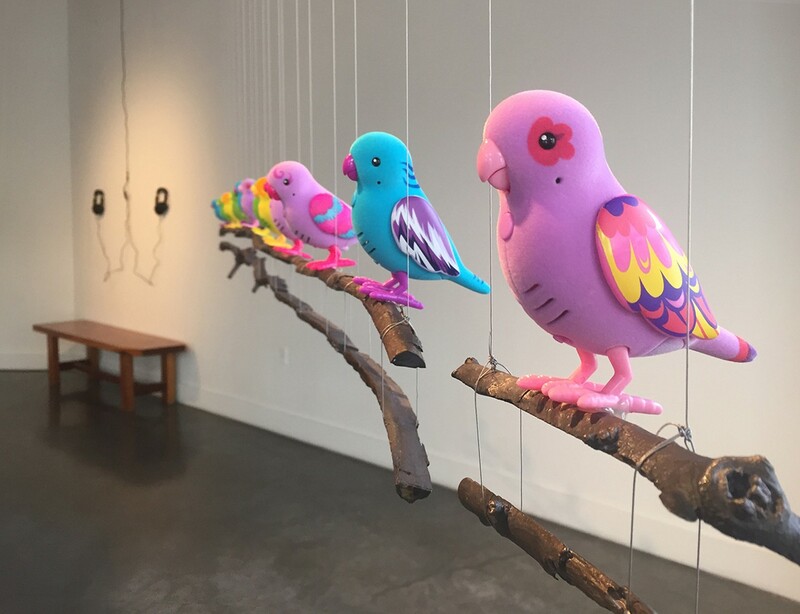 "I Know Already" features a line of fifteen toy birds perched on bronze twigs. At staggered intervals, each colorful plastic toy emits a line from "What Kind of Times Are These," a poem by queer, feminist literary icon Adrienne Rich that speaks to political issues using language about Nature. But the words are woven into the mechanics of the piece such that the poem becomes nearly unrecognizable, endlessly unraveling its conventional form through a continuous performance. In another piece, Berlier uses a camera in place of a needle to form a makeshift record player that audibly reads cross-sections of trees instead of vinyl records. The centerpiece of the show is "Bearing Straight through the Northwest Passage," inspired by a ship passing through the Bering Strait for the first time in the summer of 2013, a feat only made possible by ice melt. Berlier took the ship's path and mapped it into a track, like one that might be used in a Rube Goldberg machine. The portion of the track that represents the strait has been replaced by a wooden escalator that Berlier designed to slowly transport wooden balls up the steps before they quickly roll down the track and wait to be picked up again. "We're always told about this point where we've gone too far with the environment," said Berlier in an interview. This piece questions if we've already embarked on that negative feedback loop. It's difficult to know when we're holding on so tightly to a fantasy that's easier to face.